Chart No. 38 - Foot Adjustments for High Arch and Low Arch Through the Cuboid. The feet are sensitive structures and need care and attention plus proper shoes. These bones can be molded easier than any other group and many reflexes and pains can be eliminated by it. 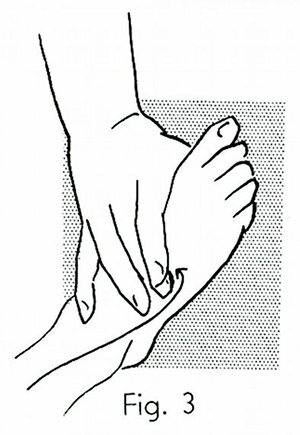 The feet reflex to the entire body. The right hand grips the arch of the foot firmly. The left hand makes a contact with the soft portion of the third phalanx of the thumb on the palmar side, pressed against the cuboid bone on the outside of the foot, and supporting the heel with the fingers. The adjustment is a twist of the right hand and a quick short thrust by the left hand. It frees the lowest joint of the big toe plus replacing the cuboid and raising the arch. It reflexes to the middle part of the body and is tonic in its effect. The reverse adjustment for a high arch. The first contact is made on the foot over the highest spot on the top of the arch by firm pressure with the strong middle finger upon it. The kidney reflex area in each foot is adjusted in the same way as the high arch. Reinforce the first contact with the other hand by using the middle finger pressure over the original contact. With the thumbs under the arch, push the foot headward and with the anterior contact firm. Then the adjustment is a mere steady push of one contact against the as a stretch. Then a quick short pull and it is done. When indicated, the adjustment can be heard distinctly. Usually it does not hurt. It reflexes to the middle of the back. The feet are the most negative pole of the entire body and because of this fact many negative energy blocks are found here that can be removed by manipulation and moulding [molding] to conform to the rest of the body in energy response which shows itself in flexibility and elasticity of tissues. Crystalization [Crystallization] and hardness spell old age decay and death. Youth is elastic. For specific reflex areas see Chart 4 and for definite functional regions see Chart 2.